Summer is finally here! Great news! 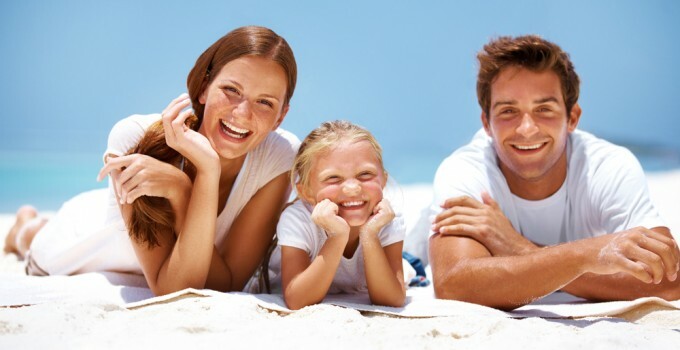 You can maintain a healthy summer smile without having to give up many of your favorite activities and foods! Here are a few tips to keep your teeth and gums healthy this summer! Establish A Brushing Routine! Stress the urgency of tooth brushing to your kids. The normal routine of school will be a distant memory, so have them focus on a solid night and morning tooth brushing routine. That way, when school is back in session, it’ll be second nature. Focus On The First Meal Of The Day! Focus on eating a healthy breakfast. Sometimes mornings can be rushed during the school year. If you have more time, try to focus on stepping away from the quick, sugary cereals, and on to a well-balanced breakfast full of fruits, whole grains and protein – not processed sugar. Go To The Dentist! Make a follow up appointment for your children – there’s more time in the summer to go to the dentist. Make sure you take advantage of the time to get any necessary procedures done! Choose Your Snacks wisely! Snack on protein-filled food! Nuts and cheese are good, healthy choices, and protein is an excellent acid-buster! Hydrate! Stay Hydrated With Water! Choose water over sports drinks, juice or soda. The sugar in sports drinks, juice and soda mixes with the saliva in your mouth and produces acids that eat away at your precious tooth enamel! Choose Ice Cream! If you must eat sweets, choose ice cream instead of sticky candy. Candy can attach to teeth! Residual ice cream is easy to wash away with a quick glass of water afterwards. Plus, it refreshing on a warn summer day! Protect your smile! Use proper mouth protection while playing outdoor summer sports like baseball, soccer and basketball. Though it might seem unconventional, using a mouth guard can prevent damage to braces or other orthodontic work, as well as prevent mouth cuts, jaw injuries and tooth damage. Get a New Toothbrush! If it’s been 3 months since you last changed your family’s toothbrush, it’s time to get a new one! Wear lip balm with SPF 15+. Let’s not forget about your lips. It’s important to use lip balm with SPF throughout the summer months because UV rays can also burn your lips with long exposure. Don’t forget to floss! – It’s always important to floss, but when what you’re eating is likely to get stuck between your teeth –(Think: corn on the cob at a weekend barbeque!) – it’s especially important to get rid of any food particles that are stuck between teeth.